This writer is happy to be back in the game. Sometimes you have to step back and just figure crap out. A lot has been happening here at the studio. So I have lots to share and some that I cannot. But, I am working furiously and even picked up a little something new to have a little more fun instead of my life being solely about the work. However, rest assured, my life still revolves around stories and amazing characters. As usual, of course. Let’s start with great progress on the next Slauson’s Cove book. I’ll be making some announcements and a cover reveal post about that soon. So, don’t forget to subscribe so that you’re in the loop when it happens. 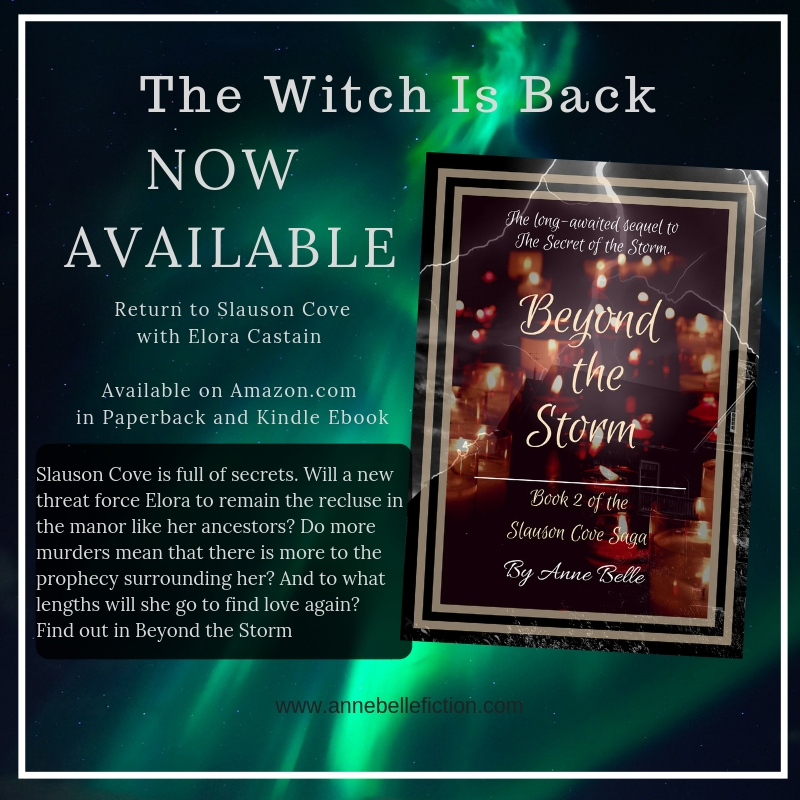 And if you haven’t read The Secret of the Storm, I’ll make a post when the price goes live but, you’re going to have a limited time opportunity to pick up the ebook /kindle editing for under $5.00 USD. Pricing should be changed any time so you can keep an eye on My Author Page for that to drop. Then I started something new to not only promote my work but also that of other indie authors. I’ve stepped into the world of narrations online with a channel I’m calling Ether Realms. You can hear the start of one of my own short stories by going to the new channel. I’m also featuring another author’s work. Serena Mossgraves sent me a great short that I wanted to present. And I am open to submissions from other indie authors and have room in the current schedule to add a few. So if you’re interested in submitting to have your story narrated and some promotion then by all means check out the website at www.etherrealmsmedia.com and check the submissions page. By way of a new hobby, I’ve finally taken a bit of a plunge. Why I didn’t get into this years ago, I’m not sure. However I admit that I’m ecstatic to have come upon table top role playing games now. We all know how introverted I am. Most of my life is spent behind the computer screen and microphone. I’m writing, editing, creating graphics, editing audio tracks, recording and so forth all the time. More often than not this is into the early morning hours. But getting out with people is rare, unless family forces the issue. I’ve been interested in tabletop games and board games for a long time. However, being an introvert, I don’t meet many people who want to play. Enter the internet and local game shops. It took me very little time to find a group starting up and an invitation to join and learn. Next thing I know, I’m setting up my own session to be a Game Master. So I’ll be posting about the adventures from time to time. Let me just say that I love this! It is immersion story telling with others. You never know what they are going to do. Playing in a fantasy world you can imagine that there are some great moments to be played out. Some players, just as in life, are braver than others and willing to take huge risks, while others play it safe to avoid being killed off in the game early on. But the exciting thing is that you have no idea what you’re going to do until you do it and you’re unravelling more of a mystery each time you take a turn and listen to what characters know or don’t know. Now, I am currently playing and DMing for Dungeons & Dragons 5e. This is my ground zero for the gaming world. But I’ve managed to get connected with a great group of people to play with at a local Gaming Shop. If you’re struggling to be social and looking for a fun way to interact with other people and get out of your own shell. I reccommend it whole-heartedly. With that, I’m going back to the work today. I’ll be pausing tonight to work on prep for my Wednesday night debut as a DM. But I am excited about it. And that’s a win! I have been firmly planted in the writing hot seat this week. I’ve been toiling away with final edits, proofs, and yes, even publication. Can you hear the gasp going on behind the screen here? Seriously though, I realized that I haven’t released any new fiction in years. For an author who wants to build a fan base that is no good. So, I had this gem of a story laying around and I decided that, while the next novel isn’t ready for outside eyes yet, it could be in a short amount of time. So, I shifted gears and got it done! Now, not only are you able to buy it for your Kindle but I am able to do some special things with it. So let’s talk about this first and give you all the details. Exorcising The Past is a short work of fiction that delves a little darker than my past work. But it also opens up a whole new area of fiction that I haven’t explored before. It introduces a team of paranormal investigators who, if readers want, could make some repeat appearances. We’ll see how the response goes. It will only be available on Kindle as an ebook. Good news is that if you’ve never read my work before and you are a Kindle Unlimited subscriber then you can get it for free. If not, the price point on this one is a fraction of what my novels sell for. So it is a great way for you to try me out before you pick up a novel or two. Life was finally coming together for Anna. When Scott asked her to help him with a case involving a four year old child being attacked by unseen forces, she didn’t hesitate. What she didn’t expect was to come face to face with demons direct from her own past. Anna must make the decision to face the past and close doors she didn’t open before she can move on with her life. Will she find a way to be rid of him at last? This is only available for purchase in ebook format. Why? Well, I wanted to create something that was more collectable. So, the print edition of this particular work is only available in a limited supply through me personally. Now, I’m reserving these numbered and signed copies for giveaways, contests, and donations. So let me tell you three ways that you can get your hands on a copy of this in honor of the release. Follow me on social media. Like, share, etc as directed over the next month and I’ll be announcing the winners of two copies on April 27th, 2018. Two come and see me at events between now and May 15th, 2018 where you can put a ticket into a fishbowl, sign up for my upcoming newsletter, and get a signed copy of both available novels. Each action will give you a chance for one of 4 copies I’ll be announcing on May 21st! That about covers it! If you’re a KU subscriber why not check it out for free tonight! It is a page turner and a quick read for you over the weekend! Then you can tell me if you’d like to see more of Anna, Scott, Evie, and Dale in the future. Maybe a collection of their paranormal cases? Let me know in the comments or shoot me an email. You know I’m always available there.Facebook to the right! Sometimes the day job gets to me and makes it hard to get into creative mode. I’ve had a stressful week at the office. It has been one of those weeks where it felt like all I could do was go to work and come home to rest. So that’s what I did. I added some new titles to my audible read list. Downloaded and just spent time doing things that were mindless and yet, allowed me to absorb and find my motivation and inspiration again. As my weekend approached I find that I am getting back to my old self and that my motivation and inspiration has returned. There is, of course, much work to be done. But, sometimes you need to step back and take a break in order to push through the roadblocks. So I sat down with my planner and realized that I have little time to prepare for events coming up. My website over at www.annebelleauthor.com has an update on those events. Details about venues and happenings can always be found under the BIO section in News & Events. There you’ll find a calendar with events listed. Skip to April to see where I’ll be so you can meet me and get your signed edition. Now that I’m back in the saddle, so to speak, I’m excited about how this book is shaping up. It won’t be long before I can put it into the hands of beta readers who will help me finish the second round of revisions. That means I’m closer and closer to getting it to all of you readers. But, not to worry. I have a little surprise coming soon that will help pass the time before the next book. Yes, I’m single. No, I’m not anti-Valentine’s Day. It just isn’t something that was ever really celebrated for me. Sure, I gave out the little cards when I was in school. As an adult, if an effort to celebrate was made it was all on me to make it a special occasion. I’m not the sort of girl who evokes a sense of romance. That’s just part of who I am. I’ve learned to accept it. Just as I’ve learned to accept being single. I used to have big dreams of a husband and kids. I tried the marriage thing for 6 years. I learned a great many things about myself in that time. I also put up with far more than I should have in an effort to make it work. That’s all part of my past though and not something to be constantly relived. Today, my goals and plans for life are much different and, I think, much more practical. I’ve accepted that a family of my own won’t happen and turned my attention toward creating a life that I find appealing and enjoyable. I spend my time writing and living vicariously through characters that fit more of an ideal for me. The truth is, I’m too old fashioned for my own good. A woman like me really can’t compete in today’s dating climate. And, to be perfectly honest, I don’t really want to anymore. I value things like loyalty and compromise. I don’t see those things in modern relationships. I’m more likely to be the eccentric aunt in my own story. The modern spinster with books on shelves as life goes on. For those of you celebrating the day of romance, I say have a glass of wine or champagne for those of us who are celebrating alone. I think I shall spend my evening in sweatpants with some icecream and my real Valentine, Pip the pup. A scary movie might take my mind off the obvious and put me in an inspired mood to keep the keys clicking away as they are now. I’ve known that I would write for the rest of my life since I was about eight years old. I grew up with a Great-Grandmother who taught First Grade for 35 years. Between her and my mother (who read to me and challenged me to read more) I had a pretty good handle on the reading and writing thing before I even officially started school. My first stories involved magical unicorns and fairytale princesses and that seems slightly hilarious to me now; seeing as I write things that are a tad darker in nature these days. But, whatever I write, this is a life-long obsession for me. It is the one thing that I do on a daily basis that I cannot fathom my day being complete without. The years have passed too quickly in many ways. I’m not the bright-eyed girl that everyone in my mother’s side of the family assumed would go on to greatness. Back in the day I was full of big dreams that involved books, deep conversations, beautiful productions, and all sorts of creative things. I imagined adult life to be very different from what it is now. In fact, I envisioned the college experience to be something wholly different than what it was for me. But that is something I blame myself for. I certainly didn’t take full advantage of that opportunity when I was given it. My writing career isn’t the only thing in life to suffer for it. In my twenties I was a gypsy in many ways. I lived in many different places spanning one coast of the United States to the other. I made friends, some of them were poor choices, all of them taught me valuable lessons about myself. And few of them remain in my circle today. The bohemian spirit is still strong with me and I often fight the temptation to uproot and start over in a new place. I suppose I’ve become a bit more practical as I’ve aged. There are other things to consider now that weren’t a part of my life before. I met a man in 2006 who I would marry the following year. It was a whirlwind romance that seemed to quell my own feelings of inadequacy in being single. I’ve never been a woman with many prospects for suitors. And I admit, I settled. I thought I wanted a more traditional life. For a while it was a novelty and served its purpose but, six years later, I found myself standing alone in a courtroom as a judge issued the order to disolve the marriage that had long been over. I regained my name and set about rebuilding my life as best I could. How did I do that? Well, I wrote, of course. In the course of two years following that day I made greater strides toward writing as a profession than I had in all six of the years I’d spent as a homemaker and sometimes babysitter to his daughter. I often joke that he was the best however many pounds I ever lost. It isn’t far from the truth though. There were so many things that held me back when I was with him. Now, with more freedom to focus on myself and what I want in life, I see that more clearly. The process of reinventing myself has been a long one. It is evolving and everlasting in many ways. I consider life to be a perpetual series of changes that are like an ocean of existence. Sometimes you have to surf the waves being high up on some curl of achievement. Other times you have to just simply tread water and hope that a safety net comes along to scoop you up. More often than not, it’s a matter of you and the boat weathering a storm into calmer waters where things are peaceful and flow freely for a while. Eventually the rest will cycle round again though. You do what you can and you roll with the tides. The creative life is an oddity. It is complicated in how we somehow find a way to sustain ourselves with our art. Even when one works a day job, as I do for now, it seems that it is always to supply the need to create somehow. But, it is also a simple life if we allow it to be. To embrace each day with the initial question of “what will I create today?” To answer that and make its answer a reality is truly all we must do to be happy. And isn’t that the goal for everyone? Simply to be happy. So tell me readers; What will you create today? How will you find your bliss?